Virtual chemistry labs can be used to significantly enhance the lab components of the advanced placement (AP) chemistry syllabus. Virtual labs can typically be accessed directly on the web without the need for any special software, which means that a laptop or tablet computer with a web browser is the only equipment needed to conduct experiments. Students can do in-class virtual lab activities right where they sit in class, and do supplemental lab assignments completely outside of class as homework. Virtual labs expand the student’s investigative capability, and build insights and intuition quickly. Virtual labs do not replace real laboratory experiments, but rather, provide an additional pathway for learning. For example, they can be aligned with AP curricular requirements to provide students with opportunities outside the conventional laboratory environment to meet specific learning targets. In addition, teachers can use virtual labs to integrate quick demonstrations into their lectures and generate data for students to analyze. To demonstrate the potential of virtual labs, I’ll use as an example ChemReaX, a free online chemistry simulation app I developed. As a technologist and software developer keenly interested in science education, I am currently creating tools such as ChemReaX to make simulation technologies easily accessible to science teachers and students. ChemReaX is a general purpose chemical reaction simulator focusing on thermodynamics, equilibrium, and kinetics. Thermodynamic properties for over 1200 chemical species are included, allowing students to model and simulate a broad range of chemical reactions. Students can control reaction parameters including the choice of reactants and products, initial concentrations, temperature, and pressure. Additional options in ChemReaX include simulation of acid-base titrations, ionization reactions of buffers, and reaction kinetics. In this article, I’ll use a few selected topics from the general equilibrium unit in AP chemistry to illustrate how students can learn critical chemistry concepts through virtual experimentation, data collection, and data analysis. I’ll first look at how one can do a simulation study of a reaction with a limiting reagent, then provide several other examples. Students can set up this reaction in the ChemReaX dashboard , selecting the reactants and products from the dropdown lists (see Figure 1). They then need to balance the reaction by setting the stoichiometric coefficients; in fact, ChemReaX will not be able to proceed with the simulation until the equation is balanced. Students must also specify the initial composition in terms of partial pressures for gases, and molar concentrations for liquids or solutions. The actual values in this example have been chosen such that the initial reactant partial pressures are higher than the initial product partial pressure, which allows the reaction to consume some of the excess reactant molecules to generate product molecules. ChemReaX assumes that the reaction takes place at constant temperature and pressure under typical laboratory conditions; in this case, I’ll use the default temperature of 298.15K and the default pressure factor of 1 (described later in this article). The reaction rate parameters are not important to any of the examples in this article. Figure 1. ChemReaX dashboard for setting up a limiting-reagent reaction. Figure 2. ChemReaX results panel for the limiting-reagent example, showing one data point. When this reaction is run by clicking the “Run the Reaction” button, the final composition (i.e., the final partial pressures) of the reactants and products are generated by the simulator. 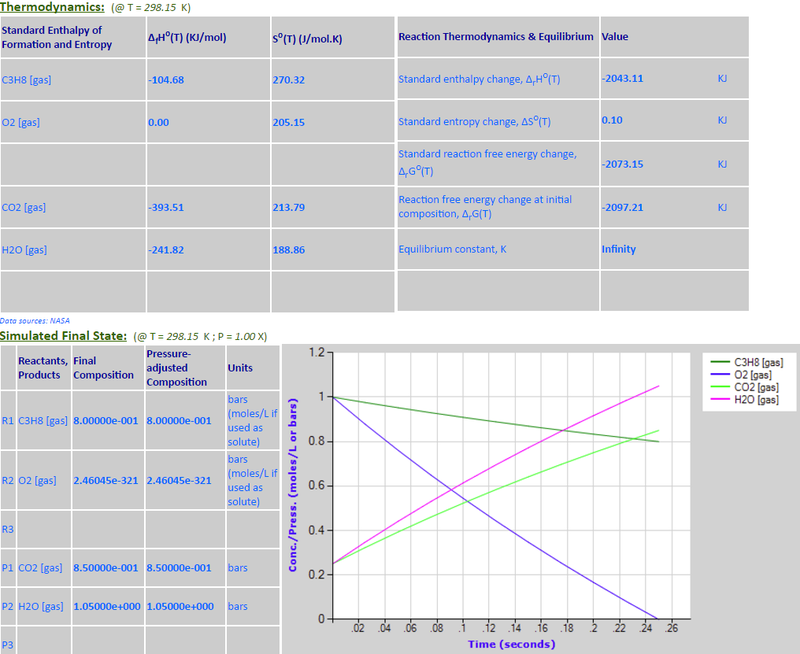 The ChemReaX results panel shown in Figure 2 displays details of the underlying thermodynamics, and shows the final simulated state of the reaction in both tabular and graphical form. The initial partial pressures of O2 and C3H8 are the same in this example, but five molecules of O2 are needed to combust one molecule of C3H8. This makes O2 the limiting reactant, and as Figure 2 shows, the reaction completely uses up the O2 leaving a significant amount of unreacted C3H8. This reaction can be set up in the ChemReaX dashboard using a process similar to that used in the previous example. For the sake of convenience, let’s start with an excess of one of the reactants, CO, so that we can focus on the other reactant, H2. The initial partial pressures of CO and H2 can be set arbitrarily to 10 bars and 1 bar, respectively, for this exercise. The initial partial pressure of the product can be set to a small value such as 0.1 bar, so that we can observe how the reactants are converted to the product. Figure 3. Results from five simulations of the exothermic reaction with temperature as the variable. Students can now vary the temperature and collect data from multiple simulations to show what happens to the reaction equilibrium as the temperature increases or decreases. These simulation results can be used to confirm the prediction of Le Chatelier’s principle: that the equilibrium of an exothermic reaction will shift to the left (toward the reactants at higher temperatures) in order to absorb the extra heat. Both the standard free-energy change and the initial reaction free-energy change increase with temperature and eventually become positive, as shown in the Excel chart in Figure 3. The final composition follows the free-energy change, consisting only of the product at low temperatures and the reactants at high temperatures. The equilibrium constant (not shown in the chart) decreases with increasing temperature. The value of graphing the data in Excel is the visual insight it provides into this important concept. As an alternative to students running the simulations and collecting data, teachers can generate the data and use charts like Figure 3 in their lectures to drive home important concepts. Teacher-generated data can also be the basis for analysis exercises assigned to students. This reaction can be set up in ChemReaX as in previous examples. The initial composition can be chosen such that the reactant quantities are 10 times greater than the initial product quantities in order to allow the reaction to proceed to the right (as before, these are fairly arbitrary values that can be easily modified). Figure 4. Results from 12 simulations of the endothermic reaction with temperature as the variable. Students can once again vary the temperature and collect data from multiple simulations of the endothermic reaction. Figure 4 shows the trend from 12 simulations with temperatures ranging from 200K to 1300K. Students can now confirm the prediction of Le Chatelier’s principle. The free-energy change, in fact, decreases as the temperature rises and the final compositions clearly show the equilibrium moving to the right. The equilibrium constant (not shown in the chart) increases with increasing temperature. Continuing with the theme of applying stresses to a reaction at equilibrium, pressure is another variable that can be studied easily using ChemReaX. The pressure factor in ChemReaX is a relative pressure setting that either increases or decreases compared to some constant pressure at which the reaction originally reached an equilibrium state. Students can set the pressure factor in the ChemReaX dashboard to values higher than 1 for pressure increases and lower than 1 for pressure decreases, allowing them to see how a reaction at equilibrium responds to pressure changes. Using the exothermic synthesis of methanol from the earlier example with the temperature now set to 298.15K and the initial partial pressures of both CO and H2 set to 1 bar, Figure 5 shows how students could also use the program to study the impact of varying the pressure factor. (Note that the chart is based on normalized partial pressures, which are actual partial pressures from the simulations divided by the pressure factor, and therefore proportional to mole fractions.) Students can use these data to confirm the prediction of Le Chatelier’s principle: that the equilibrium composition will shift in a direction that counteracts the pressure change if there are unequal numbers of gas molecules on the two sides of a reaction. Figure 5. Results from five simulations of the exothermic reaction with the pressure factor as the variable. The final stop in this investigation of reaction equilibria is to study the effect of changes to the concentration or partial pressure of any reaction component. Again using the example of exothermic synthesis of methanol, students can run a series of simulations to confirm that increases or decreases in the initial partial pressure of one of the reactants (while holding the other reactant at a constant higher partial pressure) will cause shifts in the equilibrium composition in either the forward or reverse direction, respectively. Students can demonstrate that the initial reaction free-energy change becomes more negative as the initial H2 partial pressure increases, suggesting a stronger initial tendency to convert the additional reactant to product. The final composition should indicate that most of the increase in the H2 partial pressure is consumed by the reaction and is converted to an increase in the CH3OH partial pressure, which would confirm the prediction of Le Chatelier’s principle. In this discussion, I have used topics from the general equilibrium unit, fundamental to the AP chemistry curriculum, as examples of abstract chemistry concepts that educators can bring to life using virtual labs. The learning pathway based on virtual labs consists of virtual experimentation, data collection, and data analysis. In addition, teachers can utilize virtual labs to demonstrate important concepts and generate data that can be assigned to students for analysis. While I’ve used three specific reactions as examples in this article, teachers can design virtual labs based on other reactions that correspond to lessons and textbook examples. Students can also come up with their own reactions to simulate as part of virtual lab activities and projects. ChemReaX includes thermodynamic data for a large number of chemical species, so teachers and students can construct a nearly unlimited range of reactions to study. In addition to equilibrium and thermodynamics, there are other topics in the AP chemistry syllabus that are amenable to simulation-based investigation using ChemReaX, such as acid-base titration, ionization reactions, and reaction kinetics. In addition to helping to meet specific learning targets, virtual labs make it possible for students to take an investigative and experimental approach to learning chemistry. The teaching and learning of chemistry can truly be enriched by access to virtual lab environments. Atkins, P. W., & Paula, J. D. (2014). Physical chemistry. Peter Atkins, Julio de Paula. New York: W. H. Freeman and Co.
Kumar Venkat is a technologist and software developer. He is currently working on applying simulation technologies to enhance science education, starting with virtual labs for chemistry. You can find more information about his work on www.sciencebysimulation.com/. You can find more virtual lab exercises at www.sciencebysimulation.com/chemreax.